Chris Hughes had earned a bachelor’s degree in anthropology and sociology, had been a professional musician with Saddle Creek Records bands Beep Beep and Gabardine, and had meandered through various jobs post-college before eventually landing in the technology field. The Recession of 2008 forced his hand. “I had been in tech and my job was eliminated,” he explained. The job loss created an opportunity to reflect on his experiences thus far and determine the future course of his career. As a married man with children, unemployment was not an option. In early 2010, Hughes launched Artifact Bag Co., building the business nights and weekends while working a “placeholder” job during the day. By the end of the year, Artifact was a full-time endeavor. 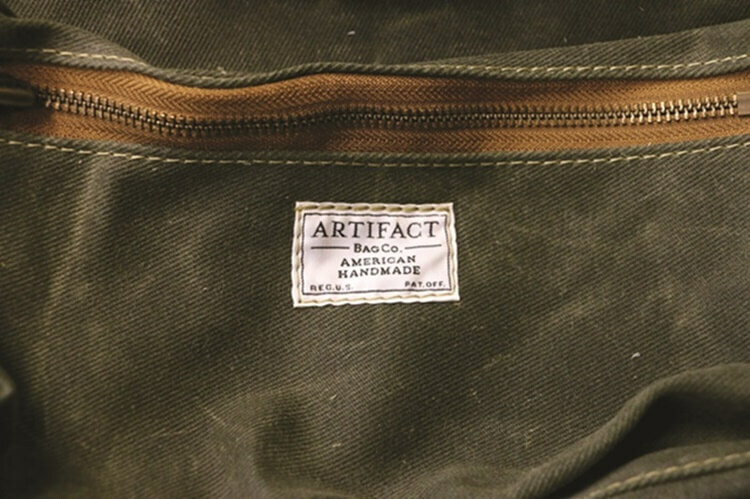 Artifact features handmade bags, totes and rucksacks; heavy-duty aprons; and pouches and wallets in a variety of materials including leather, canvas, twill, denim and awning cloth. Hughes uses domestically sourced materials whenever possible and incorporates vintage hardware and new old stock fabric into some of his products. High merchandise quality has been paramount from day one, Hughes said. Artifact started as a one-man business as Hughes tracked down and taught himself how to use — and maintain and repair — industrial sewing equipment. His tech background also came in handy for setting up an e-commerce platform and in transforming design concepts into three-dimensional products. Growth was gradual but strategic, Hughes said. 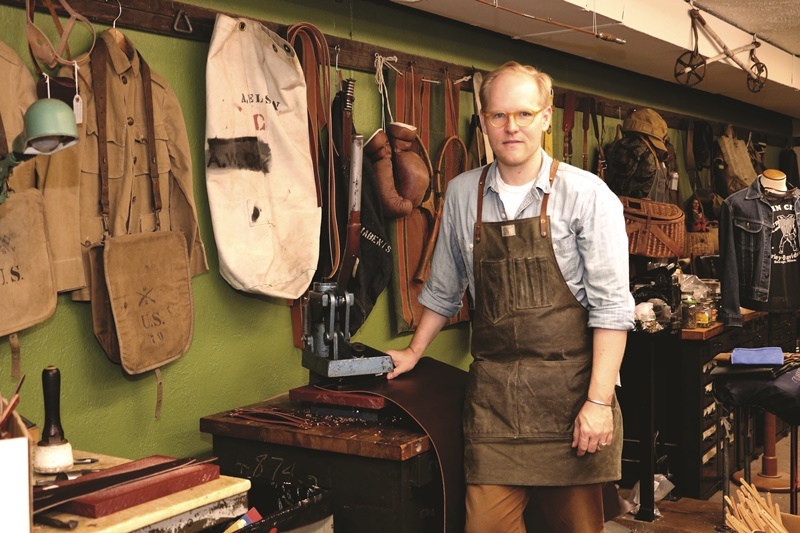 Six years into Artifact, Hughes employs six skilled workers in a shop near Midtown and emphasizes that he’s always looking for people with sewing experience. “It’s very much an apprentice model. Even if you’re a wicked seamstress you’re still going to have that little bit of acclimation to sewing on industrial equipment,” he says. He still personally designs all Artifact products in timeless and military-inspired styles that reflect his long-held love for antiquing, estate sales and vintage wear. His client demographic extends well beyond young metrosexuals, Hughes said. Through artifactbags.com, Hughes sells to buyers all over the country and his overseas business is increasing, particularly in Australia and Japan. Artifact products can be found through local retailers including Hutch in Midtown, Denim Saloon in Dundee, Lauritzen Gardens’ gift shop, the Durham Museum gift shop, and Mulhall’s. Yes, the nursery and landscaping business. “They’re doing kind of an artisanal thing,” Hughes explained. He’s even found a unique market through Paper Kite in Countryside Village. Hughes is hoping to place his products with more retailers in the western environs of the city, and that’s just one of the options for the future growth of Artifact. Artifact has already expanded into, well, artifacts. The website now includes a carefully curated selection of vintage apparel, jewelry and accessories. Hughes admits that he’d probably “make a lot more money if I’d stayed in tech,” but he also admits that Artifact not only makes the most of his broad skill set, but also has an undeniable cool factor.